Product Description: Hi-Protein Meal Replacement Shake. 35G Protein. Fiber and EFAs. Gluten Free. Complex Carbs. Vitamins and Minerals. Build Lean Muscle and Burn Fat. Lean Body hi-protein meal replacement shakes provide quick, delicious lean muscle nutrition for active people. Enjoy Lean Body's smooth, creamy award-winning taste! Lean Body satisfies your appetite and makes you feel great. Use Lean Body in conjunction with your exercise program to help build lean muscle and burn fat. Delicious Taste! 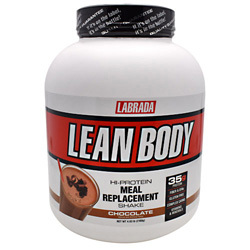 Lean Body may be the best tasting meal replacement powder (MRP) ever made. That's why the American Culinary Institute awarded Lean Body a Gold Medal Taste Award. 50/30/20 (Protein/Carbohydrate/Fat) ratio consisting of highly bio-available, time-release proteins, high-fiber complex carbohydrates, and essential fatty acids, to support lean muscle growth, strength, and higher energy, all day long! 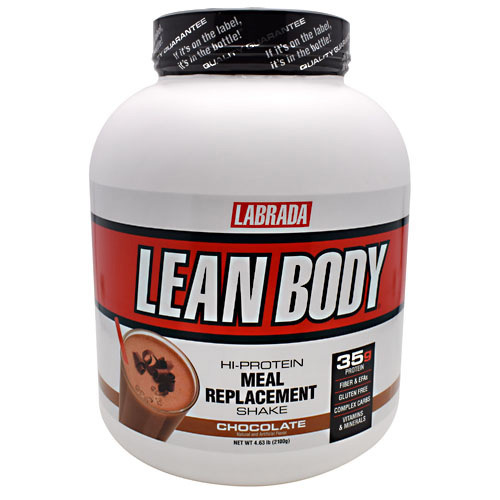 35 g of LeanPro high-quality protein to provide lean muscle support. Over 6000 mg of BCAAs (Branched Chain Amino Acids) for muscle tissue support. Over 6000 mg of Glutamine and Glutamic Acid to promote recovery. 21 grams of Complex Carbohydrates to provide long-lasting energy. 7 grams of FiberPlex Dietary Fiber per serving to support intestinal health. 7 grams of EFA-Plex containing natural-source fatty acids, medium-chain triglycerides, flaxseed oil, and borage oil. Contains 21 Vitamins and Minerals. No Artificial Colors or Preservatives. No Maltodextrin or Aspartame. No Trans Fat. Directions: As a nutritional supplement, replace 1 daily meal with a serving. To build muscle, add 1-2 servings to your daily food intake. Use 10oz of water or your favorite beverage. Add 1 serving (70g) of Lean Body and mix in a blender or shaker. Ingredients: LeanPro (Cross Flow Micro Ultrafiltered Whey Protein Concentrate, Milk Protein Isolate, Cross Flow Micro Ultrafiltered Whey Protein Isolate, Glutamine Peptides), EFA Plex (Sunflower Oil, Creamer [High Oleic Sunflower Oil, Corn Syrup Solids, Sodium Caseinate, Mono and Diglycerides, Dipotassium Phosphate, Tricalcium Phosphate, Soy Lecithin, Tocopherols], MCT Oil, Flaxseed Oil, Borage Oil), Cocoa (processed with alkali), Fiber Plex (Polydextrose, Fibersol 2 Fiber, Cellulose Gum, Oat Flour, Rice Bran), Natural and Artificial Flavors, Vitamin & Mineral Blend (Di-Calcium Phosphate, Magnesium Oxide, Ascorbic Acid, Vitamin E Acetate, Niacinamide, Electrolytic Iron, Zinc Oxide, D-Calcium Pantothenate, Pyridoxine Hydrochloride, Copper Gluconate, Riboflavin, Vitamin A Acetate, Thiamin Mononitrate, Folic Acid, Potassium Iodide, Cyanocobalamin), Fructose, Salt, Sucralose, Acesulfame Potassium. Warnings: Contains Milk, Soy (Lecithin). Note: Soy lecithin helps the powder to dissolve in water. NOTICE: Use this product as a food supplement only. Do not use for weight reduction.